Super Bowl champ Mark Herzlich shares his inspirational story and talks about how CrossFit helped him regain his strength after battling cancer. Julie Buehler reports. It was Super Bowl week in Indianapolis, and Mark Herzlich and his team, the New York Giants, were taking on the New England Patriots for a world championship. Microphones were shoved inches from his mouth, one removed only to be replaced with another. Personal questions rained on him. But he didn’t complain. Things have turned out OK. 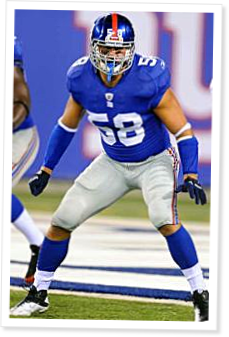 When Herzlich was introduced to CrossFit, he had recently had a titanium rod implanted in his left femur to strengthen the body’s biggest bone. He had endured months of chemotherapy and radiation and physical therapy. By the time Herzlich—a self-described "workout freak”—was ready for physical activity, he certainly wasn’t the hulking, 6-foot-4, 245-lb. Boston College linebacker who was projected to be a first-round pick in the 2009 NFL Draft. But he persevered and battled his way into the NFL. And now he’s a Super Bowl champion. On May 4, 2013, Robert “The Ghost” Guerrero faced off against boxing welterweight champion Floyd Mayweather. After 12 rounds, the decision was unanimous: Mayweather retained his title. Thank you for this inspiring story of a special young man--It's interesting to read about sports stars (and provides me good fodder to tempt my young nephews and grandchildren to try CF). For me, at 64, it's just as inspiring to read any of the hundreds of CrossFit stories that are written about regular folks achieving amazing personal growth and healthier lives by engaging in this marvelous sport. Keep both types of stories coming!